Stunning works by international illustrator and street-artist Wosnan have kick-started a three-phase project to rejuvenate an iconic attraction in the heart of Townsville. 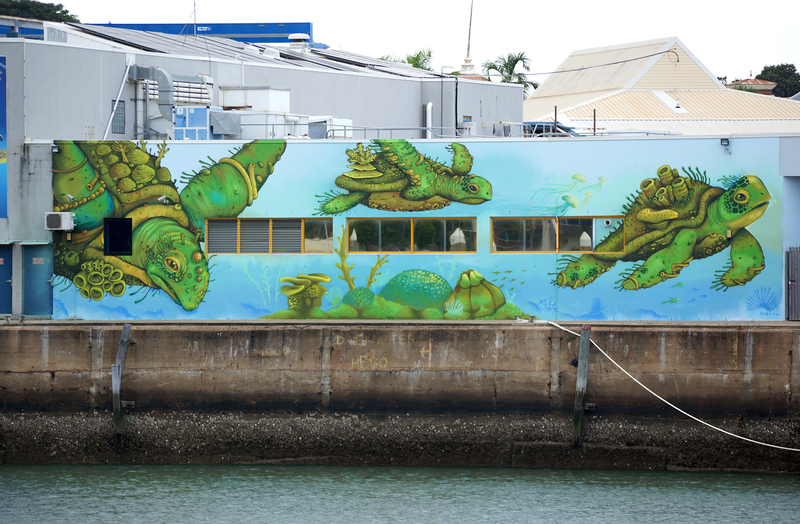 Wosnan, of Columbia, recently undertook a week long residency at Reef HQ Aquarium to paint a mythical coral creature and marine turtles on the building’s outer wall overlooking Ross River. It is the first of three murals to be created in a jointly funded $100,000 collaboration between the Great Barrier Reef Marine Park Authority and Townsville City Council (via Perc Tucker Gallery) under the Council’s Street Art Activation Framework, which is transforming Townsville’s CBD into a vibrant and lively city centre. “As the waterfront and CBD continue to develop, freshening the external appearance of an iconic attraction like Reef HQ Aquarium adds a vibrant and attractive element to the space,” Reef HQ Aquarium Director Adrienne Power said. Community and Cultural Development Committee Chair Councillor Colleen Doyle said Council was committed to fostering Townsville’s growing street art scene. “Townsville is quickly gaining a name for itself with the impressive collection of street art emerging around our city; these murals are a fantastic way of giving life to spaces again and engaging the community,” Cr Doyle said. Phase two of the street art project will involve sourcing a local artist to create an iconic piece on the adjoining exterior wall space. Expressions of interest for phase two are expected to open in late 2018. The best position to view Wosnan’s mural is from across the river on Palmer Street. Pledge what environmental actions you will take to help protect the Reef and have them publicly displayed on the Aquarium’s Pledge Wall, or send a pledge video explaining what you will do to #LoveTheReef via Facebook @reefhqaquarium. “In December, all pledges will go into a time capsule to be buried in the world’s largest living coral reef aquarium – Reef HQ Aquarium’s Coral Reef Exhibit – to be opened in the next International Year of the Reef in 2028,” Ms Power said.